Get stocked up for the next academic year or the begin of the tax year with these 100 x 12" Recycled Rulers. A large and economical way to provide every single person within your organisation with the most effective tool. Each of the rulers provided in this pack has a strength and durability to be admired. And, one that is sure to last throughout every single task they have in the making. Each one has been manufactured from 100% recycled plastic, putting it in line with eco-friendly drives and ensuring it can be recycled again at the end of its life. The range of bright and bold colours are visually captivating and can be used to distinguish between different classes, groups or departments. In turn, each one has been printed with contrasting line and number measurement indicators down each side. They come in a 30cm length and provide these measurements in both centimetres and inches alike. The smooth finish minimises the risk of injury, as do the rounded shoulders and perfectly finished edges. These rulers are designed for continuous use and have the strength to withstand a slight flex and repeated use. We understand the need for a budget-friendly option that suits your organisation and its requirements. 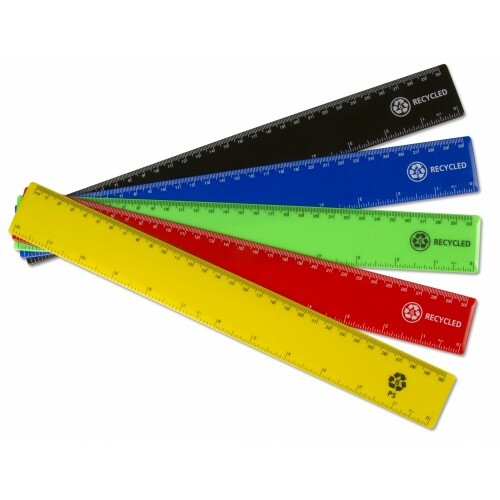 This large pack of rulers offers 20 of each of the 5 colours and comes pre-packaged for your convenience. Store to one side until required or assign each one to an individual person to ensure the entire team is equipped to handle every task.